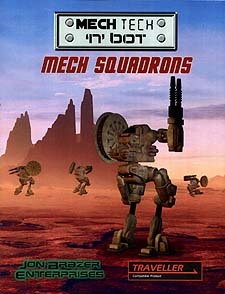 Ready to ride fire with the hottest walkers this side of the galactic core, Mech Tech 'n' bot: Mech Squadrons brings you over twenty walkers for you to blast your way through any obstacle. From the small two-legged MegaHerc construction mech to the heavy, six-legged Barga artillery tanks, this supplement contains walkers ideal for every use. Additionally, mass combat stats are detailed for squadrons of each mech described, helping you and your players to have epic battles. Several mech operator careers, example NPCs and additional weaponry are included to customize your machines and characters.